Miami Trace’s Libby Aleshire putts during an FAC match at the Club at Quail Run Monday, Aug. 13, 2018. Aleshire was the medalist of the match with a score of 46. Washington’s Raven Haithcock watches the flight of her tee shot during a Frontier Athletic Conference match at the Club at Quail Run Monday, Aug. 13, 2018. The Club at Quail Run was the site of the second Frontier Athletic Conference golf match of the 2018 season Monday, Aug. 13. McClain won the match with a 218 score. Miami Trace was second with a team score of 239. Jackson was third with a 271 and Washington was fourth with a 286. Miami Trace freshman Libby Aleshire was the match medalist with a 46. Senior Raven Haithcock had the low score of 67 for Washington. McClain was led by Bryn Karnes with a 49 and Kylie Defoy led Jackson with a 62. Other scores for Miami Trace: Makayla Barnes, 58; Meri Grace Carson, 66; Alyssa Butler, 69; Regan Hagler, 73 and Destinee Butcher, 76. 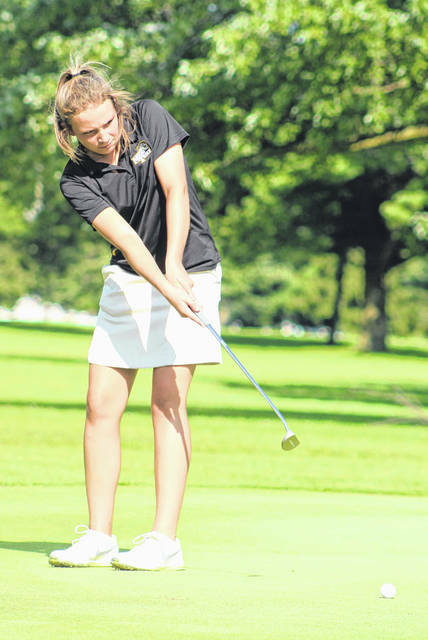 Other scores for Washington: Savannah Osborne, 70; Eryne Croker, 74; Haley Hixson, 75; Taylor Hixson, 78; Breanna Taylor, 82. 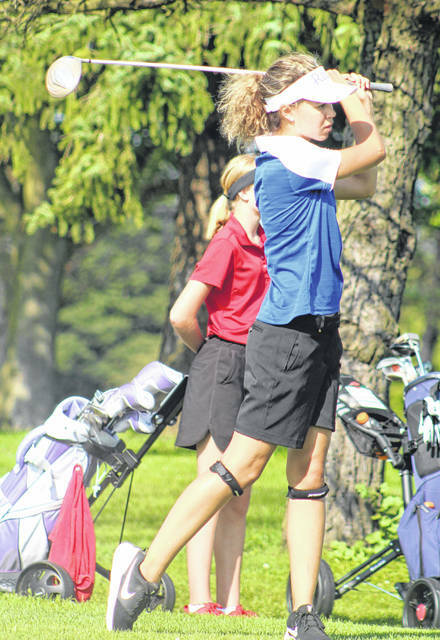 Other scores for McClain: Erika Martin, 54; Bri Weller, 54; Cassidy Willis, 61; Shayna Beatty, 64; Liz Kegley, 68. Other scores for Jackson: Sierra Stiffler, 69; Madeline Lewis, 70; Kylie Duncan, 70; Isabella Scullytenpenny, 71; Kaltra Woltz, 78. Washington’s next match is Wednesday, Aug. 22 at Hillsboro at 4 p.m. That will be the third FAC match of the season. Miami Trace’s next match is also Aug. 22 at Hillsboro.